2017 was the year of synchronized global economic growth. 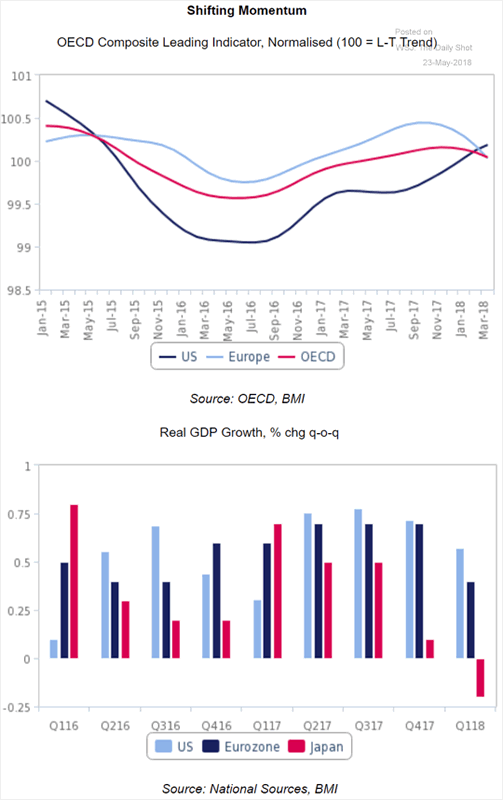 Almost all major economies around the world saw an upswing in economic growth. As you probably already know, 2018 is turning out to be a different story. Global synchronized economic growth is over for now. The U.S. economy continues to grow at a healthy, unabated pace. Other developed and developing economies are seeing a small decrease in economic growth. You can see the slowdown in ex-U.S. economies through other data series as well. The Ifo Business Climate Index is Germany’s best economic indicator. It has slowed down throughout 2018. But when you put things into perspective, you can see that this isn’t a massive economic slowdown for Europe’s economic engine. The Eurozone’s Economic Sentiment Index (ESI) is Europe’s best economic indicator. It has also slowed down year-to-date in 2018. But once again, the slowdown isn’t significant when you put things into perspective. 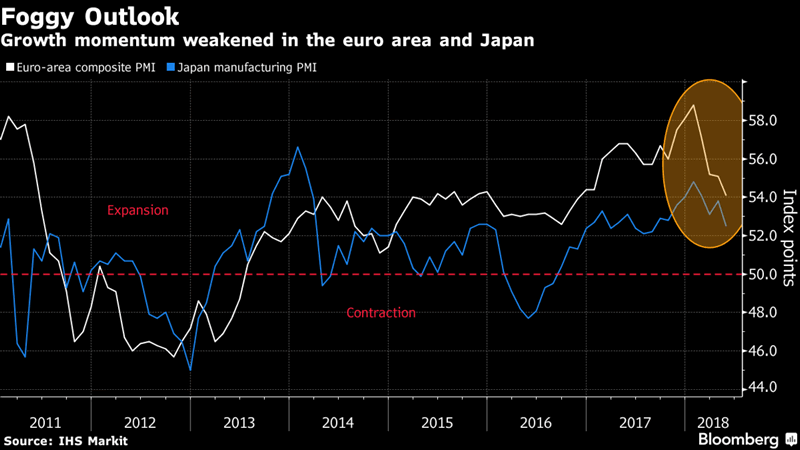 European and Japanese PMI are deteriorating a little. 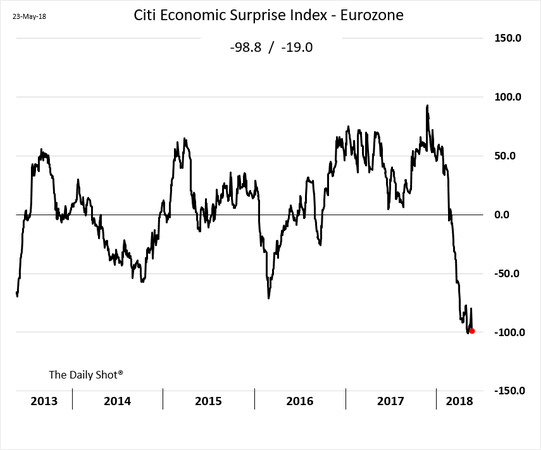 Eurozone’s Economic Surprise Index continues to fall. This is about as negative as it gets. The current global economic slowdown is small compared to previous global economic downturns. Perspective is everything. The U.S. stock market doesn’t care about global economic downturns. The U.S. stock market cares about U.S. economic downturns. The U.S. stock market and U.S. economy move in the same direction in the medium-long term. The U.S. stock market usually ignores economic problems in other countries. This means that other countries’ economies can deteriorate while the U.S. stock market trends higher. *The U.S. economy is frequently impervious to economic deterioration in other countries. This is because the U.S. has a relatively isolated economy, unlike other countries (e.g. China, Germany, Japan). 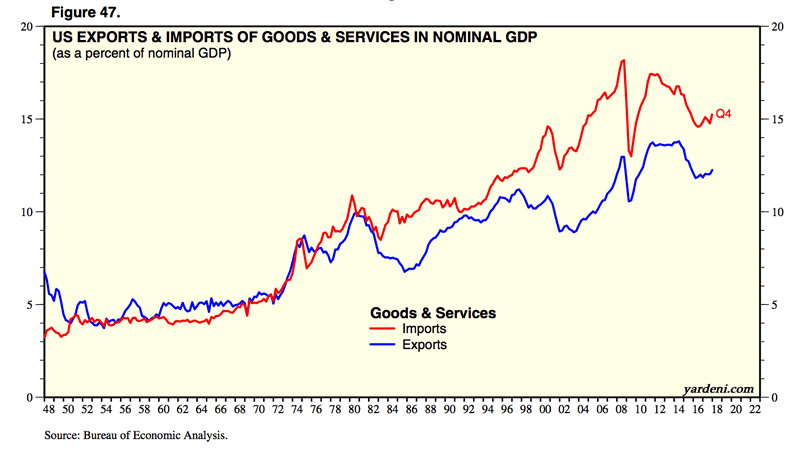 The following chart demonstrates that only a small portion of U.S. GDP is accounted for by exports. Here are historical cases in which major foreign economies deteriorated but the U.S. stock market still trended higher. Europe’s economy deteriorated significantly from early-2011 to late-2012, as shown through Europe’s Economic Sentiment Indicator. The U.S. stock market trended higher during this time because the U.S. economy continued to grow, even though there were 2 “significant corrections” that the Medium-Long Term Model was able to predict. China’s economy deteriorated significantly from 2010 to early-2016, with the bulk of this decline occurring from 2010 – 2012. The U.S. stock market (S&P 500) trended higher throughout China’s economic slowdown. Emerging markets – particularly countries that relied on commodities exports – saw significant economic deterioration from mid-2014 to early-2016 as oil prices collapsed. The collapse in oil caused many EM economies to collapse as well. The U.S. stock market mostly swung sideways with high volatility (i.e. a “significant correction”). 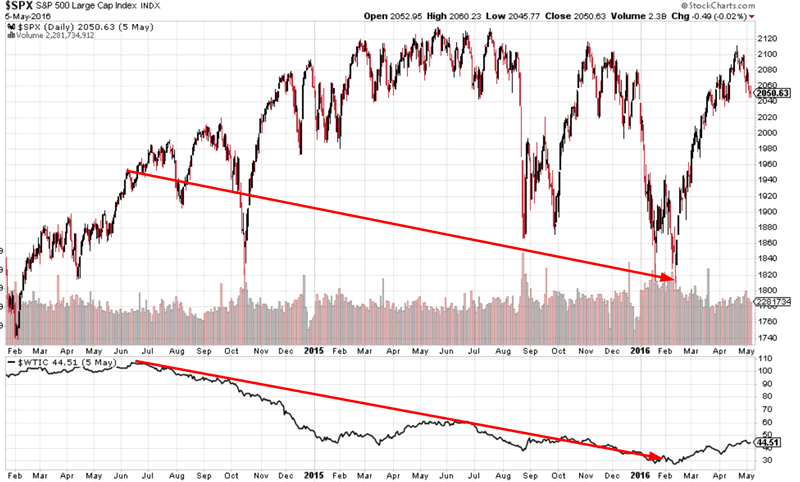 The U.S. stock market did not crater. Germany’s economy deteriorated from late-2014 to mid-2005, as shown through the IFO Business Climate Index. The U.S. stock market swung sideways, with a 6%+ “small correction” along the way. Japan’s annual GDP growth rate cratered from late-1990 to late-1993. The U.S. stock market trended higher during this period. As you can see, deteriorating foreign economies usually cause increased U.S. stock market volatility. The worse the foreign economic deterioration becomes, the more volatility there is in the U.S. stock market. But deteriorating foreign economies isn’t a medium-long term bearish factor for the U.S. stock market. The U.S. stock market doesn’t make a massive decline when foreign economies are deteriorating. The U.S. stock market only makes a massive decline when the U.S. economy deteriorates significantly. Once again, remember that the current deterioration in foreign economies is relatively minor. Perspective matters. U.S. stock market investors and traders should focus on the U.S. economy instead of foreign economies when predicting the U.S. stock market’s medium-long term direction. The U.S. economy continues to grow at a healthy pace.